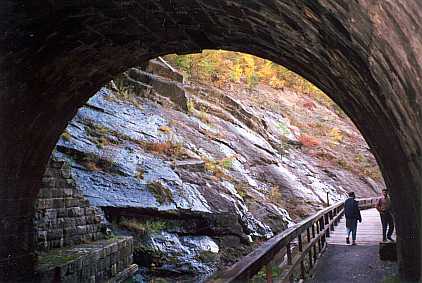 The Paw Paw Tunnel lies along the notorious bends of the Potomac River that confounded George Washington's plans to move trade and settlement west along the river. After meeting inventor James Rumsey in Bath the previous year, Washington hired him in 1785 to design locks along the river for the newly launched Potomack Navigation Company. They made several trips together along the route of the Potomac but Rumsey lasted only a year in the job. The Potomack Navigation Company ultimately failed and its assets were eventually turned over to the C&O Canal Company. Beginning in 1836, the C&O Canal Company took 14 years to carve a 3118 foot tunnel through Sorrell Ridge eliminating several miles of river bends. Named the Paw Paw Tunnel, it was dubbed by American promoters as a wonder of the world. At 24 feet high, it is the largest manmade structure on the C&O Canal and is lined with more than 6 million bricks. Construction of the tunnel was a horror of black powder blasting and hand dug slag that ate up men, managers and money. By the time it finally opened in 1850, the railroad had arrived and rendered the canal obsolete although mules and canal boats transported manufactured goods through it until 1924. Today, part of the C&O Canal National Historic Park, the restored canal towpath leads from a small park along the road to the gaping mouth of the dry tunnel. Walkers and cyclists are welcome year 'round. National Park rangers lead guided tours on weekends in summer. The tunnel is just a mile north of town along route 51.